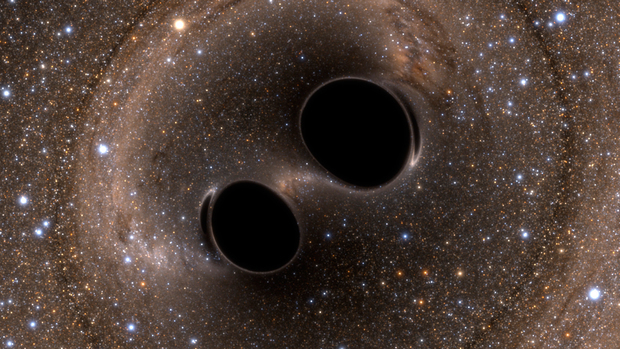 Computer-generated image of two black holes in the process of merging. Credit: the LIGO Collaboration. One hundred years ago, Albert Einstein published his theory of general relativity. It was a radical new idea that overturned Newton’s theory of gravity and said things got much more complicated when you were near a massive object. Strange as it was, it was widely considered to be proved after Sir Arthur Eddington showed that light from distant stars was bent as it passed near the Sun during a solar eclipse. Since then, Einstein’s theory has been a runaway success, and numerous other strange predictions that it made have also been vindicated. Time slows down in a gravitational field? Check. Light is redshifted in a gravitational field? Check. Black holes? Check. Gravitational lensing? Check. The expansion of the universe? Check. Some of these Einstein himself didn’t believe until they were proven to him, but they’re all real. But there was one prediction* of general relativity that hadn’t be proved yet…until now: gravitational waves. Einstein predicted that just as an accelerating charged particle emits electromagnetic waves, so too an accelerating mass produces waves in the gravitational field. These waves would be extremely difficult to detect because the gravitational coupling constant is so tiny–that means that gravity is much, much, much weaker than electromagnetism–by a factor of 10^39! But it turns out there is a way to detect them. Gravitational waves do two things. First, they bleed off energy from orbiting objects, causing them to slowly spiral together. For very massive objects like neutron stars, this is fast enough to notice. In 1974, the Hulse-Taylor binary pulsar was discovered, where two neutron stars are spiraling together, just like Einstein predicted. But this wasn’t a direct detection–only circumstantial evidence. The second thing gravitational waves do is stretch and squeeze the space they pass through very slightly. Scientists working on the LIGO and Virgo gravitational wave observatories built laser interferometers to measure distances with incredible precision to see if any gravitational waves were passing through. LIGO can measure a four-kilometer beam path to a precision of one part in 10^21–more than a million times smaller than an atom! This is because of the way the laser beam interferes with itself as it bounces between mirrors that are miles apart. The strongest gravitational waves in the universe come from black holes colliding and merging together. This produces waves in a very specific shape that last for about a tenth of a second. They’re hard to detect, and rare, but they can be detected from billions of light years away, and after years of searching, LIGO and Virgo saw one, finally proving the last untested prediction of Einstein’s theory right! The two black holes were an estimated 36 and 29 times the mass of the Sun before they collided, and 3 times the mass of the Sun was lost as gravitational waves. And the collision was so powerful that we could detect it 1.3 billion light years away. See here for the press release and here for a free copy of the primary scholarly paper (one of many). This discovery opens up a whole new field of gravitational wave astronomy. Only time will tell what we can learn from it, but it looks like it’s going to be exciting. * Technically, we haven’t directly observed a black hole yet, although we have pretty solid evidence. We’re actually getting close to that one, too, though. The Event Horizon Telescope is an effort to take a picture of the black hole at the center of our galaxy with radio telescopes, and it might succeed this year. This entry was posted in Current events, Science, Space and tagged einstein, general relativity, gravitational waves, LIGO. Bookmark the permalink.